Yes! Please reserve my pastured chickens! Note - Our next processing date, which may change by a day or two, is around June 8. Fill out the reservation form below and we'll be in touch! We work hard to raise sustainable chickens. 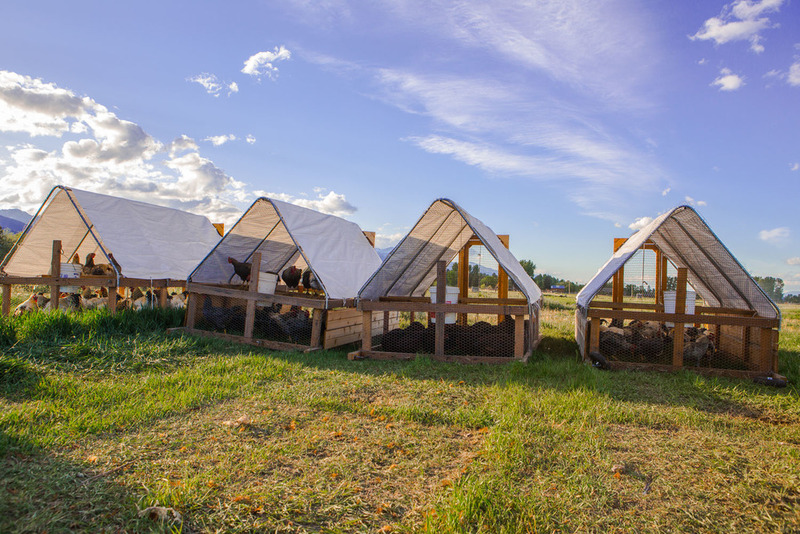 This batch of heritage chickens have been raised on pasture in custom, moveable chicken tractors. Birds are moved twice daily and fed fermented organic non-GMO grains and supplements to ensure they have a balanced diet. This is our first time raising heritage meat chickens and we appreciate your support -- it allows us to continue improving our integrated animal and vegetable farming systems and raise even better, healthier chickens. As a small farm processing on our place, we are able to sell poultry through a very specific set of conditions: each chicken must be sold while still alive. We can then do you the favor of butchering it on-farm, following the processing protocols we use for ourselves (including that brand-new chicken plucker, and packaging into food-grade plastic shrink-bags for easy storage and/or freezing), but we are not charging you for that butchering service. You could of course elect to take your live-purchased birds home to do yourself, instead, but most folks are happiest to have us take care of that and pick up the bird processed and ready for the kitchen. To read more about how we raised this chickens from chicks, see our blog post here. Birds are between 4 and 5-1/2 pounds and the price is $4 per pound. Would you prefer one of your chickens cold and ready to eat (from the walk in cooler) on the day of processing or frozen? Yes. If possible, I'd like one ready to eat. Please go ahead and freeze all chickens. Optional: Please list your ideal budget for a 4 pound chicken. We know we charge more than the grocery store, and when figuring out our costs, and how we can improve, we take this information into account. Our current batches of chickens cost approximately $12 each to raise. Questions, comments or fanmail is appreciated! Would you like to know when we have chickens available again? Note: Next butchering is scheduled in about two weeks. Thank you! We'll be in touch by phone (or email) about your chickens. Please don't hesitate to call us if you have questions! Thank you! We will let you know when your chicken is ready for farm pickup at the farm!